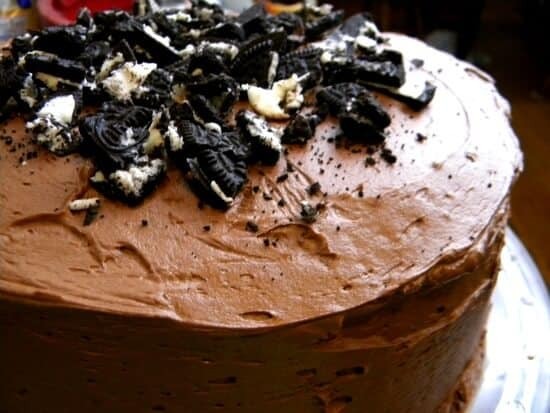 There isn’t much that is better than a great chocolate cake recipe unless it is a great chocolate cake recipe that has a fantastic cookies and cream filling and then is slathered in rich chocolate frosting. That, my friends, is what we call chocolate nirvana. Please step away from your computer so that the drool that is about to flow does not damage your keyboard. Doesn’t that look ….. oh yeah it does. 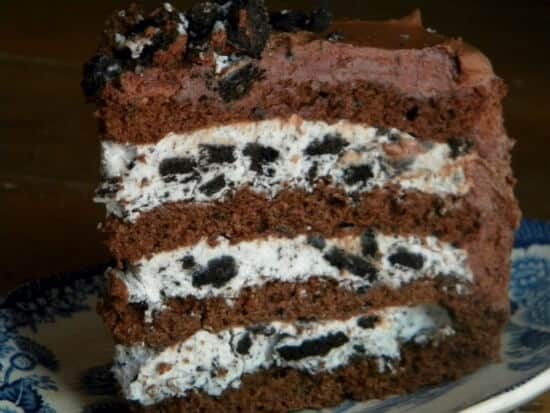 Four, count ’em, FOUR layers of rich, moist chocolate cake with three layers of thick filling with crunchy bits of Oreos swimming in vanilla flavor. Slather on a thick coat of chocolate frosting and …BAM! There it is. Here is the deal. Each bite is perfectly balanced between cake and filling. The cake is moist, the frosting is creamy, the cookies add a nice crunch. 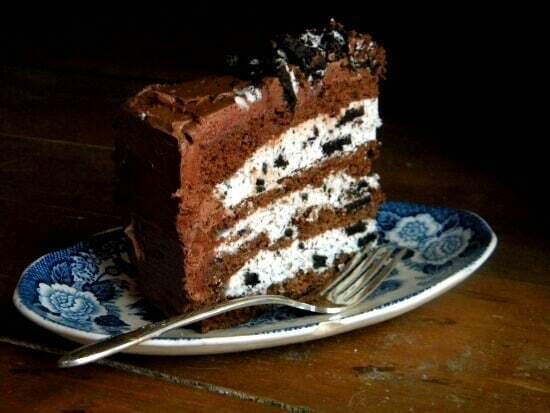 This is a cake for those among us with a sweet tooth that may well have once belonged to the saber toothed tiger. Cut the slices thin and serve espresso or a stout Earl Grey tea. 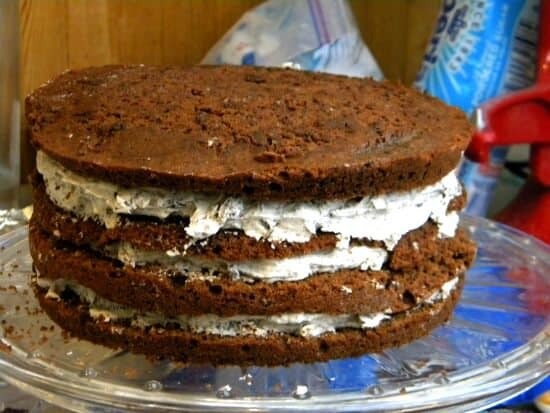 The cake is baked in two layers and then cooled. It is dense enough that slicing each layer in two is simple. Once you have the cake and filling put together push four drinking straws down through the cake to stabilize the layers. Put it in the freezer for about 30 minutes. 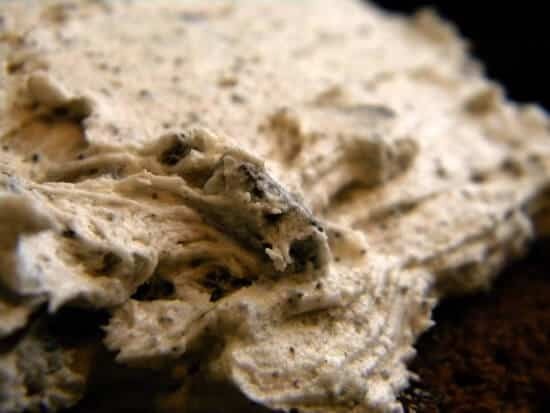 Take it out of the freezer and put the crumb coat on then slip it back into the freezer for about 30 minutes before you put the final frosting on it. Top with some crushed cookies and it’s ready to go. This really isn’t as complex as it looks, goes together easily, and would make a great cake for a birthday or other celebration. Just a hint — If you have trouble with your cake tops being domed try making a hollow in the center of the cake batter once it is in the pan It doesn’t have to be real deep but the sides will rise a little differently than the center and your cake will be flat on top. Rich chocolate cake is split into four layers and filled with a thick, rich cookies and cream frosting. Just wondering if I can use this for a stacked cake or should this be the top layer ? It’s probably a little delicate for a stacked cake. I’m in the process of making this cake. The creamy filling seems too thick, but I’ve already added a little more than 1/4 of heavy cream. Should I just add more? It’s thick enough that I’m having trouble spreading it onto the layers. I’m sure it’ll taste great when it’s done, though. Mari – just saw this. It is a very thick filling – you can certainly think it down as needed. Oh my goodness, Marye this dessert looks absolutely heavenly!! Your warning was too late, as I was already drooling on my keyboard just looking at the preview photo of this post! 🙂 Can’t wait to make this cake!! OMG!! How amazing does this look and sound??!! 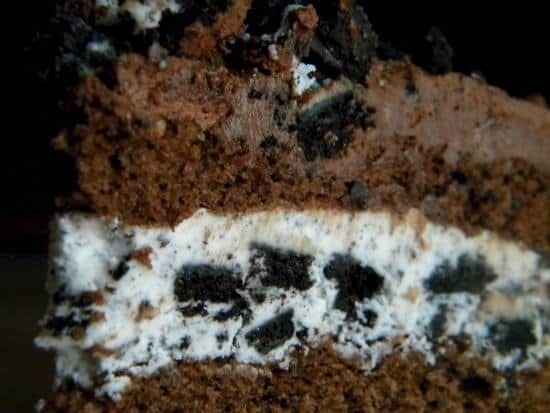 I adore Oreos in desserts, this looks just beyond. Love!! Oh Wow – am going week in the knees just looking at this! That filling, that frosting, those moist layers of cake! Wow!!! 🙂 thanks so much Shashi!